As each spring semester nears an end, MS URPL students, faculty, staff, and partners gather to celebrate the culmination of URPL students’ work toward their master’s degree. 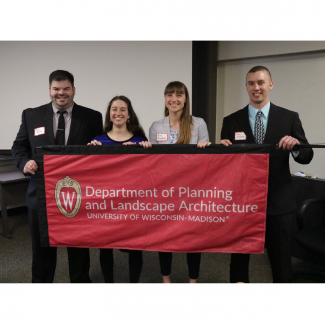 This past May, thirteen master’s students presented their final projects in the City-County Building, co-sponsored by the Dane County Planning and Development Department and City of Madison Planning Division, in addition to the URPL Alumni Relations Council (ARC) and the Wisconsin Student Planning Association (WSPA). 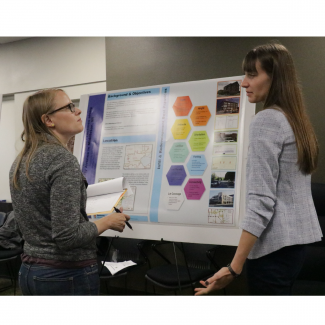 The afternoon was filled with poster viewing on a variety of topics, from addressing the affordable housing crisis in Wisconsin to the feasibility of having an intercity bus terminal in Madison. Four out of the thirteen students further presented their projects individually. Beth Richmond spoke on Middleton, Wisconsin’s best practices around small-scale infill and redevelopment. Lisa Charron presented on her development of a comprehensive plan assessment tool for creating healthy rural communities. Logan Dredske presented his findings on reducing greenhouse gas emissions by improving transportation accessibility. Ryan Thompto shared where the future of regionalism in Dane County is headed. The presentations were followed by a brief Q & A, and the event concluded with further poster viewing and judge evaluations for “Best Poster.” Gillian Cooper took home this year’s award for “Best Poster”. Her findings focused on the gap around housing supply and demand. Welcome remarks were provided by Ken Genskow, Department Chair and Professor. Presentations were followed by a poster session and engagement among attendees. Gillian Cooper won the 2018 MS URPL Project Forum Award for Best Poster and Logan Dredske received the Jack R. Huddleston Award for the Best Professional Project Award. Following the signature event, WSPA hosted the Annual End of Year Picnic where folks celebrated in (chilly) community at James Madison Park. At the MS URPL graduation ceremony, Haley Briel and Ryan Thompto were both awarded the 2018 Jessica Bullen Community Service Award and Lisa Charron was awarded the 2017-18 AICP Outstanding Student Award. Congratulations, all, on your much-deserved accolades! We’re excited to announce the Sixth Annual MS URPL Professional Project Forum will be held on Friday, May 10th, 2019 at the Madison Public Library in downtown Madison. This year’s Forum will be followed by a graduation celebration for our MS URPL 2019 graduates! Mark your calendars!